What can I say except you’re welcome, for the tides, the sun, the sky! Hey, it’s okay, it’s okay. You’re welcome! I’m just an ordinary demi-guy! Maui, the demigod in Disney’s newest animated classic, Moana has captivated the world with his singing, dancing, sailing, and overall being (plus, being voiced by Dwayne “The Rock” Johnson helps). Maui takes on the world with Moana, as the unlikely pair travel across the sea to return the heart of Te Fiti to its rightful home. As fans of the movie know, Maui gets his shapeshifting powers from his magical fish hook, a gift given to him from the gods. It allows him to transform from his human body to any animal, from a beetle to an iguana to a shark to a gigantic hawk. 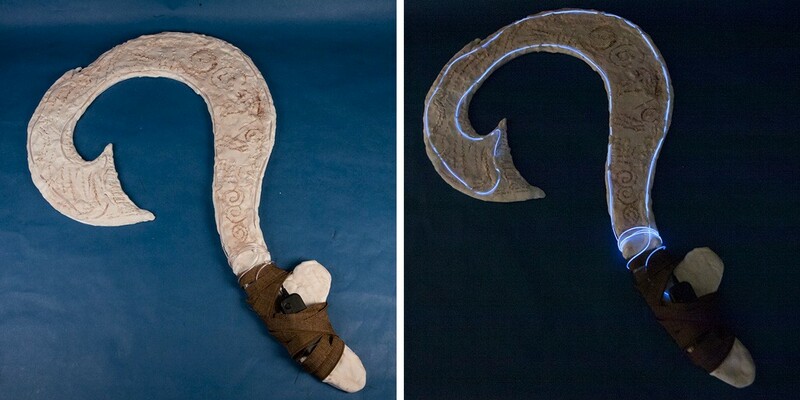 Now, thanks to this awesome and easy to do DIY costume accessory, you can make your own version of Maui’s fish hook! 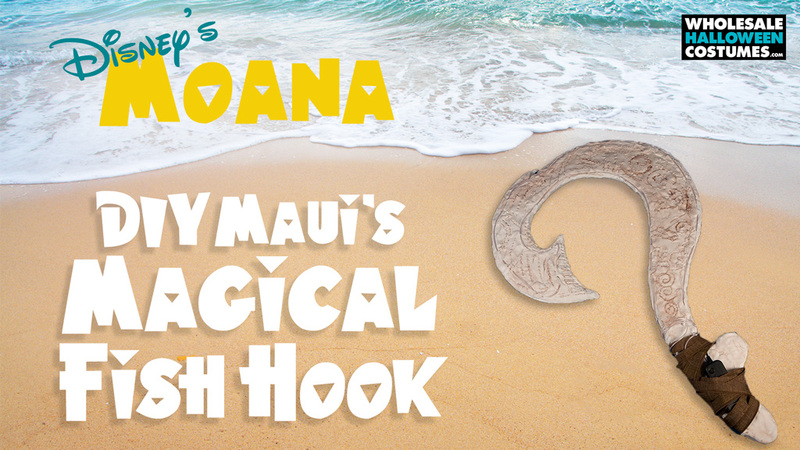 If you’re dressing up as Maui for Halloween, you’ve got to have your fish hook! You’re not Maui without it! Make sure to take a peek at the matching Moana costumes we have to offer while you’re at it! Step 1. Print the template pieces and tape them together, as shown, to create the hook. Step 2. 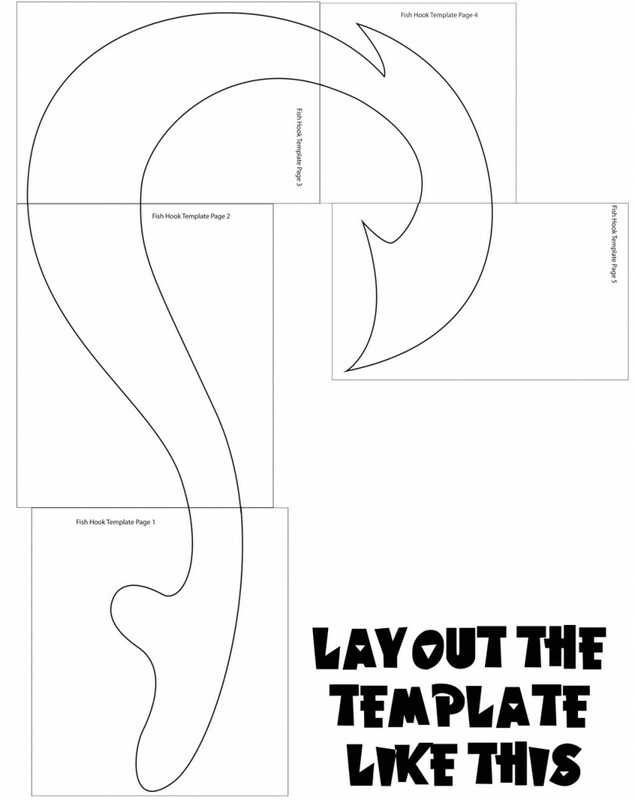 Tape the template to a sheet of foam core. Trace the template about 1/4” larger on all sides, cut out with the craft knife. Step 3. Trace the template exactly to size on 2 other pieces of foam core and cut them out. Layer the 3 fishhooks together with the larger piece in the middle. Hot glue the pieces together. Step 4. Spread small pieces of model magic onto the hook. Press the model magic so that it creates a thin layer, just thick enough to cover the foam core. Step 5. Continue covering both sides of the hook, leaving just the middle of the handle uncovered, as shown. Step 6. Place the battery pack for the Electroluminescent Wire along the handle, wrapping any extra cord around the handle. You can hot glue the battery pack to secure it. Step 7 Wrap the brown ribbon/twine around the handle, covering the battery pack, but leaving the on switch accessible. Step 8. Press the wire into the model magic around the entire edge of the fishhook. If the model magic starts to dry out, add small pieces of “wet” model magic to help hold the wire in place. Wrap any remaining wire around the handle. Step 9. Let the model magic dry slightly. 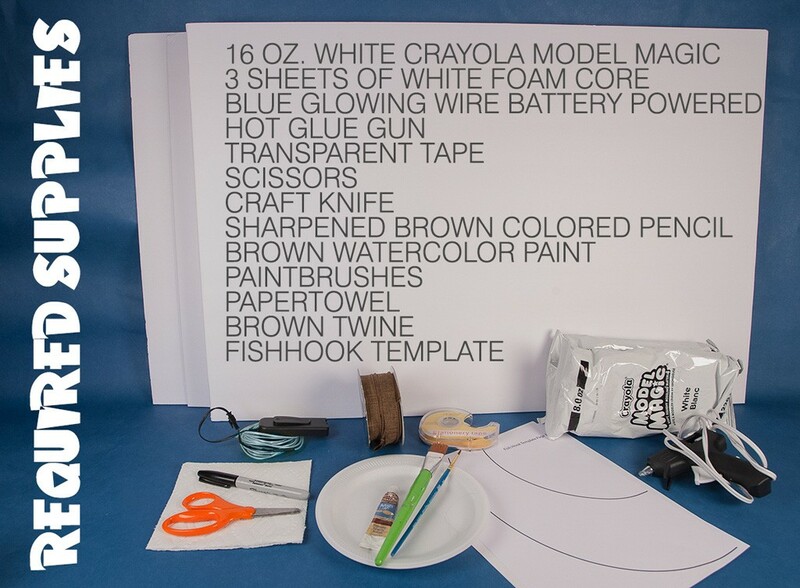 Use the sharp brown colored pencil to draw designs in the model magic. To keep the model magic from cracking too much, press the pencil down in short strokes as you make the designs. Step 10. 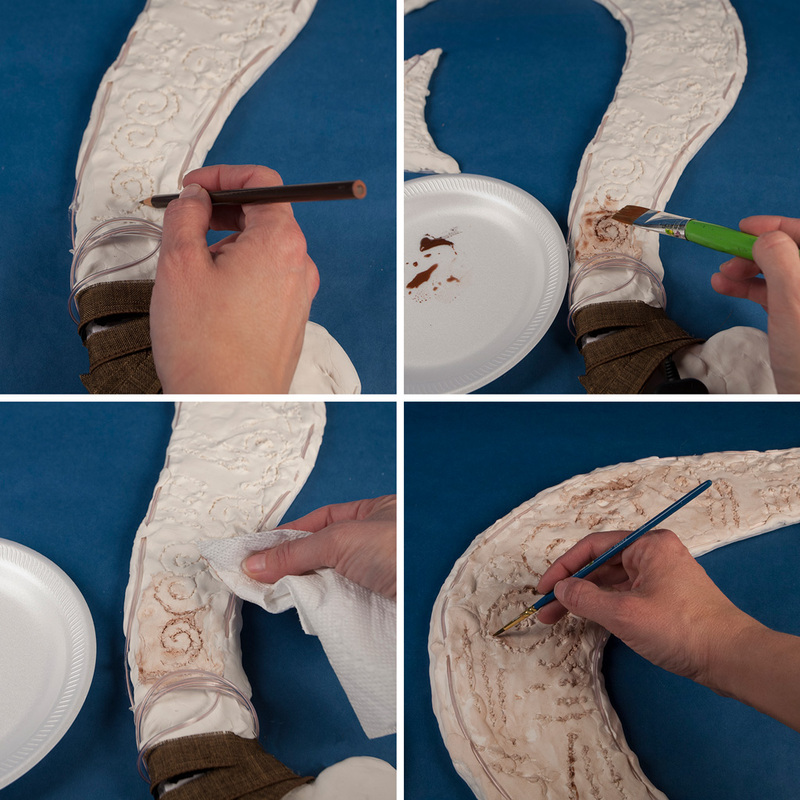 Water down the brown watercolor, and apply to a small section of the fishhook with a large brush. Step 11. While the paint is still wet, wipe some off with the paper towel. The paint will soak into the drawings and make them darker. Step 12. Continue this process on the whole fishhook. When done, use a smaller brush to paint some of the lines darker. Step 13. Add the watered down paint to the exposed model magic areas around the handle. The fishhook is done. The carved and painted model magic will have to look of traditional scrimshaw. Step 14. Light up the electroluminescent wire for an awesome effect. Save this handy Pinterest guide for later.